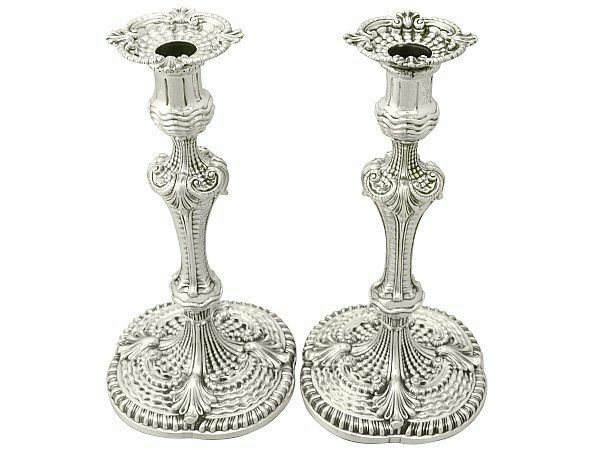 These magnificent antique Georgian cast sterling silver candlesticks have a baluster shaped form with a waisted knopped stem onto a shaped base. The bulbous capitals are embellished with a contemporary bright cut engraved crest depicting an eagle with wings displayed, uplifted. The capitals are fitted with the original detachable sconces ornamented with gadroon decoration to the quatrefoil shaped rim in addition to a leaf design to each incurve. The surface of the sconces, bulbous portion of the capitals and the waisted columns of each antique candlestick are ornamented with impressive quilted decoration; the quilted pattern is more commonly found on flatware and rarely seen on candlesticks. The shoulders of each column are further ornamented with four gadroon decorated scrolling designs in addition to leaf motifs. The bases of these Georgian silver candlesticks are embellished with further unusual quilted ornamentation accented with large shell designs subdividing the shaped subtly sunken wells, encompassed with gadroon decorated borders in the same style as the shoulders of the columns and sconces. These Georgian candlesticks are an exceptional gauge of silver, exceptional quality and in exceptional condition. The engraved crest to each piece has wear, in keeping with age. 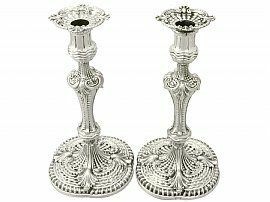 Full hallmarks struck to the underside of the rim of each candlestick are all very clear; the hallmarks are struck deeply due to the exceptional gauge of silver.